In a small San Francisco row house, a man in a white smock pins down a large white-haired woman in a bed to give her an injection. Later, the woman, Ethel Janowski, is given electroshock treatment. Then her grandmother (who appears to be roughly two years older than Ethel) comes to the little house to check her granddaughter out of the clinic. Her grandmother takes Ethel, who now has red hair instead of gray hair, back home. Once home, Ethel eats large amounts of food, which the filmmakers intend as comical according to the silly plucking strings on the soundtrack. Ethel also complains that the doctors tried to kill her by not giving her enough to eat. “My heart’s just fine as long as my stomach’s not empty,” she says, succinctly defining the film’s philosophy. Director Nick Millard (aka Nick Philips) presents many artistic shots during the moody opening act of the film, even when Ethel is performing her everyday routing such as walking up the stairs with a tray full of Nilla Wafers and hard candies. 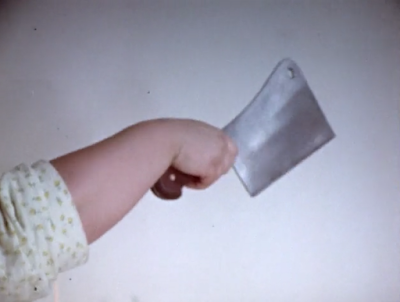 When her grandmother locks up all the food in the house, Ethel stabs her with a big knife, resulting in much blood but no holes in the woman’s nightgown. She gets a box of Nilla Wafers out of the cabinet, despite the fact that there is another box of Nilla Wafers in her bedroom. “I...cut myself on a broken bottle,” Ethel answers, though there is no blood on her. Later, Ethel disapproves of her sister bringing drunk men home. Ethel also starts to dig a grave in the backyard to dispose of the rotting corpses of her grandmother and the delivery boy, but the ground is too hard so she decides to use air freshener. Instead of imitating her sister and killing him with a knife, she makes love to him. The next day, Ethel murders the doctor from the clinic, who is checking on her. 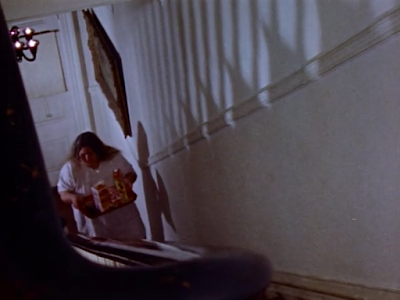 In an extended sequence the filmmakers intend as repellent, Ethel sits in a chair eating some kind of ice cream loaf while her sister and John make out and snort cocaine on the sofa. Later, Rosalie and John (who we find out is her pimp as well as her boyfriend) complain about the smell of rotting flesh in Grandma’s room, so Ethel waits for them to go back to sleep, pulls a meat cleaver from under her pillow, and walks to their bedroom. She (finally) hacks John up, as well as her sister. John, however, survives multiple cleaver blows to the head and face. He crawls out of the room, but Ethel hacks him up some more, finally killing him. Then she puts them back in their bed and talked to them while eating an enormous baked potato, before sleeping next to John’s corpse. Having run out of living people to kill, Ethel practices on mannequins in some of the most artistic shots of the film. She also wears a shiny red dress and runs past San Francisco’s Palace of Fine Arts. In the end, Ethel can do little more than spray furniture polish to cover up the smell of decay, so she decides to hack up the bodies with a meat cleaver and dispose of them. 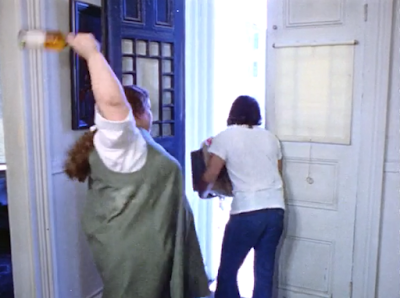 However, a police detective (played by prolific actor George ‘Buck’ Flower) has entered her house. He sits in her living room and questions Ethel. Eventually, she answers the detective’s questions and goes back to chopping up her victims. 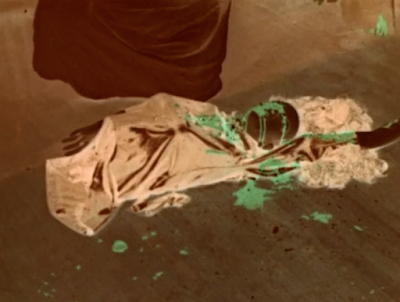 Then she loads body parts into a laundry bag and hauls them to a cliff overlooking the Pacific Ocean. In an effective e comedic sequence, she is unable to toss the bodies over the cliff because a family parks at the same scenic overlook as Ethel and starts taking photos. She is forced to drive all the way back to San Francisco and lug the body parts back into her house. The finale has a neighbor find a severed hand in Ethel’s trunk, imitating another visit from the detective, who again walks right into the house without invitation (or warrant). And the shock ending shows Ethel is disposing of her victims in an altogether different way. Much has been written about Criminally Insane. One of the most fascinating aspects of the film on which writers disagree is the likability of the main character, Ethel Janowski. The film gives the viewer no choice but to follow Ethel in her adventures, but is Ethel likable? The answer is not clear. Described on paper, Ethel is simply a mentally disturbed young (or perhaps old) woman with various problems that should make her sympathetic, but she is also a murderer, a racist, and an anti-Semite. I would assert that perhaps Ethel is the forerunner of the flawed, generally male characters that have made such an impression on television in recent years. Despite her flaws, Ethel is eminently watchable, and even sympathetic throughout most of Criminally Insane, due in large part to the formidable skills of actress Priscilla Alden (who tragically died of complications related to diabetes in 2007). Another fascinating aspect of Criminally Insane is its running time, a minimalist and efficient 61 minutes. 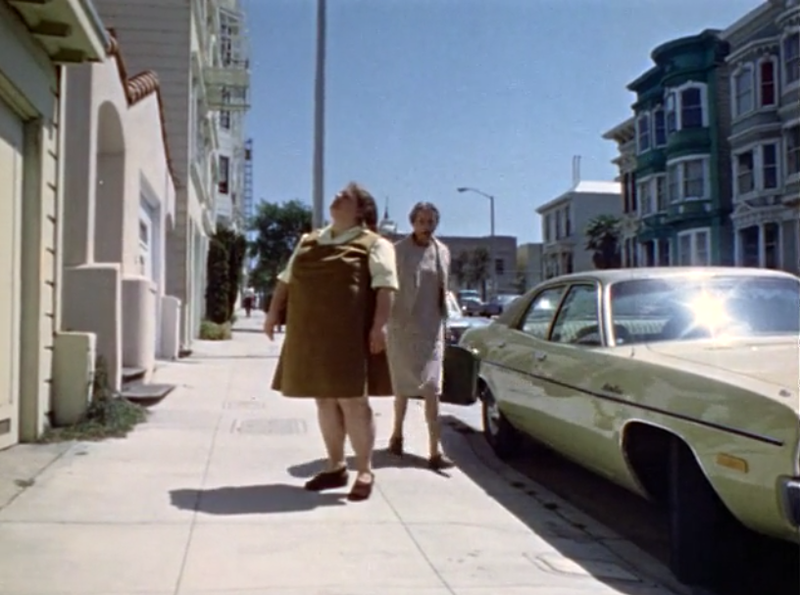 It is unclear if 61 minutes was considered feature-length in 1975, or if audiences thronging to see the film at the cinema were disappointed by the short run time (though, of course, it is difficult to imagine anyone being disappointed by Criminally Insane). This is a question whose answer is, sadly, lost to history. A third fascinating aspect of the film is the fact that so much of the dialogue rings true. When Edith says, "My heart’s just fine as long as my stomach’s not empty," we believe this is the absolute truth. Further, when tells the grocery delivery boy, "I don’t have eighty dollars! I only have four-fifty!" we know that the filmmakers are right there with her. This last quotation is particularly inspirational, as Mr. Millard (aka Mr. Philips) has proven that four-fifty is enough to create nothing less than an enduring cinematic classic.